Changing consumer patterns revolutionize the packaging industry. The trend towards on-the-go products, for example, is driving demand for resealable packaging, especially in the food sector. The current Ceresana study on the global plastic caps and closures market analyzes the segments lemonades (CSD = carbonated soft drinks), water, juices, alcoholic beverages, other beverages, food, cosmetics & pharma, as well as other applications such as household chemicals and industrial applications. The market report examines the demand for the different types of closures: screw caps, flip top caps, disc top caps, dispenser, sprays, lids, and overcaps. In the upcoming eight years, analysts at Ceresana expect – based on the number of units – an increase of worldwide demand for plastic closures by about 3.2% per year. In 2017, screw caps accounted for more than two thirds of the global market for plastic caps and closures. Their market share, however, will decrease as competition from other types of closures increases significantly, for example flip top, disc top, dispenser or sprays. The growing demands of consumers are increasing the demand for plastic closures that allow easier handling and accurate dosing of package contents. However, there are major regional differences. For the 19 most important countries, the industry report examines the demand for the plastic cap and closure types "screw caps", "flip top and disc top caps", "dispenser and sprays", and "lids and overcaps". The different requirements for closures within the individual application areas as well as the different designs of the several types have an effect on the choice of the respectively used plastics. The study on the worldwide closures market offers separate figures for the plastic types polypropylene (PP), polyethylene (HDPE and LDPE), polyethylene terephthalate (PET), Polystyrene (PS), as well as the aggregate of “other plastics”. In addition to the change in packaging types, for example the trend towards stand-up pouches, other factors are also influencing demand and determine the plastic caps and closures market trends. Consumer health concerns and government taxes on beverages containing sugar are inhibiting demand for carbonated soft drinks or juices in many countries. In contrast to that, demand for bottled water is likely to continue to account for high growth rates in the upcoming years. However, the individual factors and the resulting market dynamics can vary considerably from region to region. Thus, the market situation of the individual countries is analyzed separately in the chapters 2.1.1. to 2.5.7. Chapter 1 provides a description and analysis of the global market as well as the regional markets for plastic caps and closures – including forecasts up to 2025. Figures on production and demand in billion units are given for each world region. Additionally, the study also contains a distribution of global demand for plastic caps and closures into the plastic types polypropylene (PP), polyethylene (HDPE and LDPE), polyethylene terephthalate (PET), polystyrene (PS), as well as the aggregate of “other plastics”. Chapter 2 provides figures on production, import, and export of, as well as consumption of plastic caps and closures in billion units for 19 countries. Additionally, demand for plastic caps and closures for each country is split by area of application as well as types of closures. Chapter 3 offers a detailed analysis of various application areas of plastic caps and closures: data in billion units on development of demand in the segments lemonades, water, juices, alcoholic beverages, other beverages, food, cosmetics & pharma as well as the aggregate of “other applications”, such as household chemicals or industry & transport. 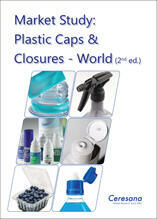 Chapter 4 analyzes the market for plastic caps and closures split by the types of closures “screw caps”, “flip top and disc top caps”, “dispensers and sprays” as well as “lids and overcaps”. The divided demand is arranged clearly for each of the 19 countries and for all world regions (in billion units). Chapter 5 provides company profiles of the largest plastic caps and closures manufacturers – clearly arranged according to contact details, revenues, profit, product range, production sites, and profile summary. In-depth profiles of 72 producers are given, including ALPLA Werke Alwin Lehner GmbH & Co KG, Amcor Ltd., Berry Global Group, Inc., Reynolds Group Holdings Limited, RPC Group Plc., San Miguel Corporation, Silgan Holdings Inc, Sonoco Products Co., Ltd., Tetra Laval Group, and Toyo Seikan Co., Ltd.